Well, mere mortals apart from the Fairy, of course. More Christmas shots from 2005. 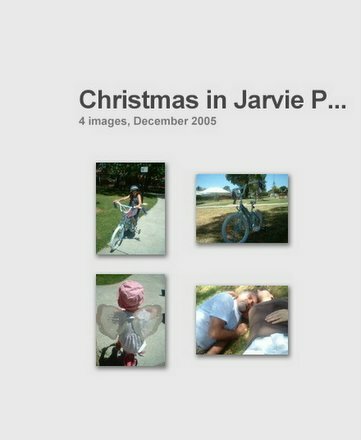 After opening a thousand or so presents, we took the Pea Princess’ new bicycle out for a test pedal in Jarvie Park. While there, the Prof and I found Santa had brought a little something for us, too: independent children. Just what I’d been wishing for all these years!! …which is when Batman came along with the dodgy digital camera and fired this last shot off. There it is. Photographic proof that our kids are growing up.